As Low As $1,299.00 with Initial Training Session and Unlimited Free Follow-up Training & Containment Guarantees. Click the items below for more details. Phantom Pet Fence always does the first training session onsite with you and your dog after the system has been installed. Once we have completed this session you will know what to do to continue the process of helping your dog(s) get accustomed to the new boundary. The reason that we only need to do one session is very simple, our systems are 100% adjustable by you, thereby eliminating the requirement of paying for an executive dog walker who controls the programming of the receiver. Our systems enable you to gradually increase the correction as you see fit until your dog has a healthy respect for the boundary. Phantom Pet Fence guarantees that our systems will contain your dog(s) assuming (1) they are installed by us, (2) they are operated and maintained as we instruct, and (3) you notify us when any problem occurs so we can quickly diagnose and resolve the issue. There are many factors that are out of our control and only you can provide us with the information we need to insure there are no escape issues. 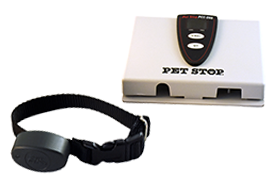 If your dog needs an stronger correction, or some other combination of settings, than the receiver is capable of delivering, Phantom Pet Fence will provide a receiver that will do the job for the most stubborn of dogs. 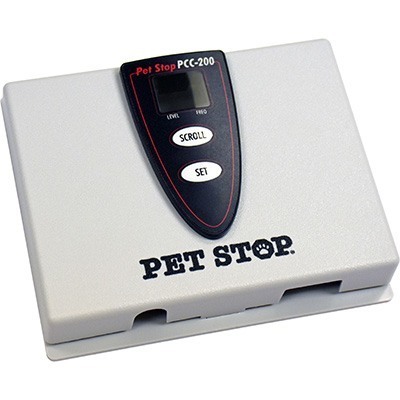 Regardless of the Pet Stop® Brand system you choose our containment guarantee applies. If you have a Perimeter Technologies system and waived the containment guarantee and later need a different receiver due to escape issues, simply pay the $150 upgrade cost for the receiver that we recommend. Each of our systems include containment for up to one acre with any layout you choose. This means that we will install the wire where we can safely operate our wire trencher (see video) to establish containment boundaries. If excessive hand digging or manual placement of wire is necessary (more than 20 linear feet) to accomplish your layout request, our technician will evaluate the additional time required and give you a cost for this additional labor and you can decide if you want to proceed or simplify the design. Perimeter Technologies & Pet Stop® Brand transmitters are covered under this unique “Lifetime” parts guarantee! If lightning strikes and damages your transmitter, simply notify us and we will make arrangements to get you a new one and retrieve the damaged unit. Zapp Alert® is an audible and visual warning system alerts you if a surge occurs in the transmitter. This feature is a Pet Stop® exclusive that will help protect your pet by letting you know immediately when your system is down. After the 1 year manufacturer warranty expires on a component, Phantom Pet Fence will replace a broken, or malfunctioning PCC 200 system component with a brand new one for a $129 handling fee which includes diagnostic testing, tax and shipping costs. The new replacement component will have a new full 1 year manufacturer warranty that begins when you receive it and when it expires the process repeats with the Limited Lifetime Warranty. If you have a Perimeter® Technologies system we honor the terms of the Limited Lifetime Warranty that applies to that system. Contact us if you have questions. Not sure what layout to choose? Hourglass layout with front & back zones? No worries, don’t let that keep you from getting started. We know you may realize the layout you selected is not working for your situation after using the system for a month or so and changes are necessary to make life easier. If there is a dispute between you and a neighbor claiming that the wire was installed on their property, we will move it at no charge to you. We highly recommend that you speak with your neighbors prior to installation and mutually agree on where the property lines are. In most cases these conversations prior to install will prevent potential conflicts over encroachment issues. Most people can identify their property lines without the expense of doing a property survey. If you are having a difficult time determining your property lines we recommend installing well within what you think is your property to be safe. Unfortunately we have no way to determine this for you. Your county GIS website has property parcel mapping resources that can provide you with very accurate Google earth imagery of your property lines. 6 Month Money Back Guarantee! In order to provide you with a 100% risk free opportunity and put a Hidden Fence to the test with your dog(s) to make sure it is the best solution for containment, we offer you a 6 month money back guarantee giving us the opportunity to prove it to you. All we ask is that you stay in communication with us when a problem arises and allow us the opportunity to resolve the issue. If we are not able to accomplish this to your satisfaction we will refund 100% of your payment for the system, send a representative to recover the equipment, and disable the wire. If we do not hear from you about any problems or you choose not to allow us to help resolve the issue and then request a refund, we will evaluate your situation and come up with a resolution that is fair and equitable. Regardless of the type of driveway you have, we simply use our concrete saw to clean out a natural expansion joint and insert the wire 2″ deep and re-cover with material that came out of the joint. If your driveway has no joints we will make a fresh clean cut where you instruct us to and seal it if necessary. If we damage a sprinkler head, water line, or control wire as a result of installing your hidden fence system we will fix it at our expense or pay a reputable company of our choice to repair the damage in a prompt time frame. This applies to professional name brand equipment such as Rainbird, Toro, & Hunter systems. We expect you to notify us as soon as you discover a problem so that we can take action to resolve it. If you choose to take a discount and waive the sprinkler guarantee, we highly recommend that you mark your sprinkler heads and we will avoid them during installation. We use the highest quality 18 gauge direct burial grade wire available. It is professionally trenched in on average of 4” deep. Our proprietary machines cut an incision into your turf with a custom knife that feeds the wire behind it automatically. In thick healthy turf, most people have a difficult time location where the cut is after we are done. The flags and tire tracks from our machine are usually the only visual clues as to the location of the wire. A common misconception is that the gauge of the copper is somehow a factor in the longevity of the system. This is a myth perpetrated by companies that want to charge more money for heavier gauge wire (16 & 14). The reality is that copper will begin to deteriorate and eventually break as soon it is exposed to the elements due to a breakage or damage to the casing around the copper wire. The 18 and 14 gauge that we offer comes with identical 45 mil casing that is extremely durable and will provide many years of uninterrupted service. 14 gauge copper wire costs more but provides no additional benefits to the longevity of your system. Because of this we do not encourage the upgrade, but we do offer it for an additional cost if you prefer this option. We are so confident in our installation process and the materials we use that we provide a peace of mind 1 year service guarantee on the buried wire that we install. We also offer optional extended warranty protection packages for an additional cost. For more details on the below items, contact us. Waterproof Receiver weighs only 1.1oz. Phantom Pet Fence and Perimeter Technologies are not associated with Invisible Fence®, Dog Guard®, Dog Watch® or PetSafe®. These trademarks are the property of their respective owners.